How's your weekend going? I'm feeling quite accomplished so far - I work up super early on Saturday thanks to my trusty alarm clock aka LO, made breakfast, went to the park, and then managed to get some shopping done at the mall while LO napped in the stroller. I should use that technique more often - by tuckering her out at the park, I was able to shop in peace while she rested. I got some much needed updates for my wardrobe now that the new season is around the corner. Lots of bright colors to perk up my outfits! With March in full spring, one of the anticipated holidays is St Patrick's Day. I have to remind myself to wear green that day because I know I'll get pinched otherwise. That silly tradition makes that holiday one of my least favorites. 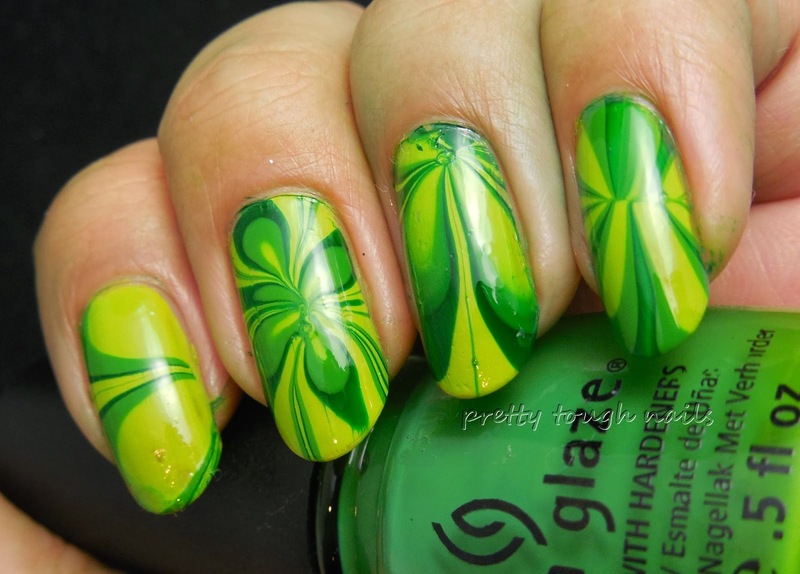 In anticipation, I decided to try some watermarbling, in hopes that maybe I could replicate a clover somehow. 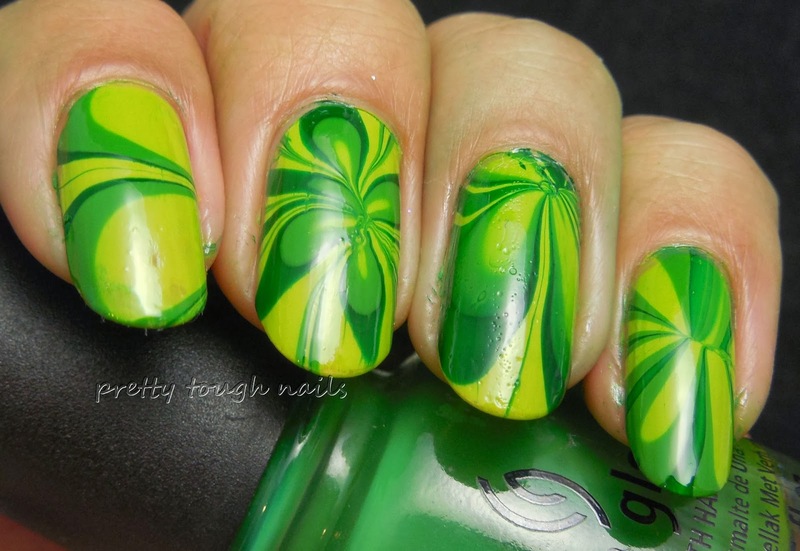 I used SH Grass Slipper as my base, and included ChG Entourage and SC Last Chance for the watermarble. Grass Slipper, the lightest green, was surprisingly excellent and a possible one coater with smooth application. My apologies in advance, I couldn't find any tape so I had some major cleanup to do afterwards. One of those suckers stains like a m@f@ so be forewarned - it's probably SC Last Chance because it's the darkest of the three. Excuse the green skin and poor cleanup! Ok, not my best work, but I do like the combination of colors. It screams spring and all of its vibrant growth and lush renewal of nature. 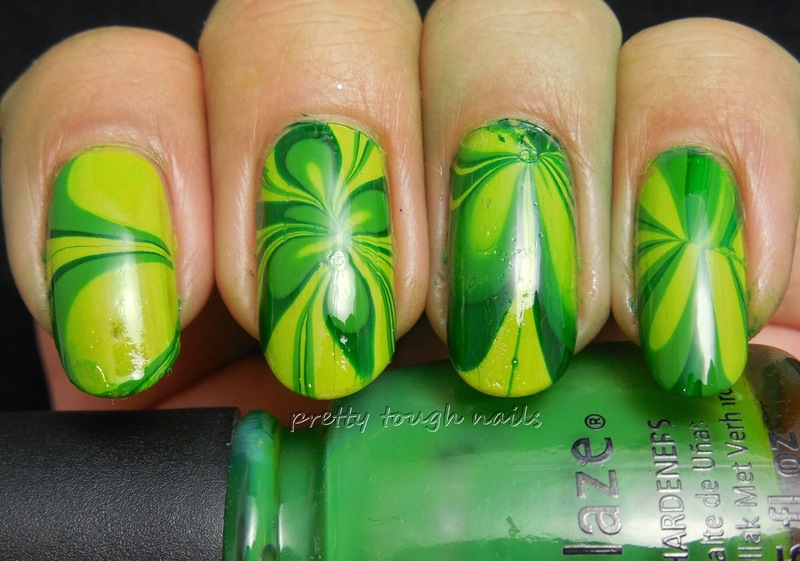 My favorite nail is the middle finger, I got the best four leave clover on that attempt. The rest turned out mediocre, but at least complimentary if using that as the center point. I didn't bother watermarbling the other hand, instead I used a layer of SH Grass Slipper and then layered Tipsy Turvy Nails Beer Bad for some sparkle. It's a bit ironic, because the beer is bad on St Paddy's day, that is, if you're drinking the green kind. 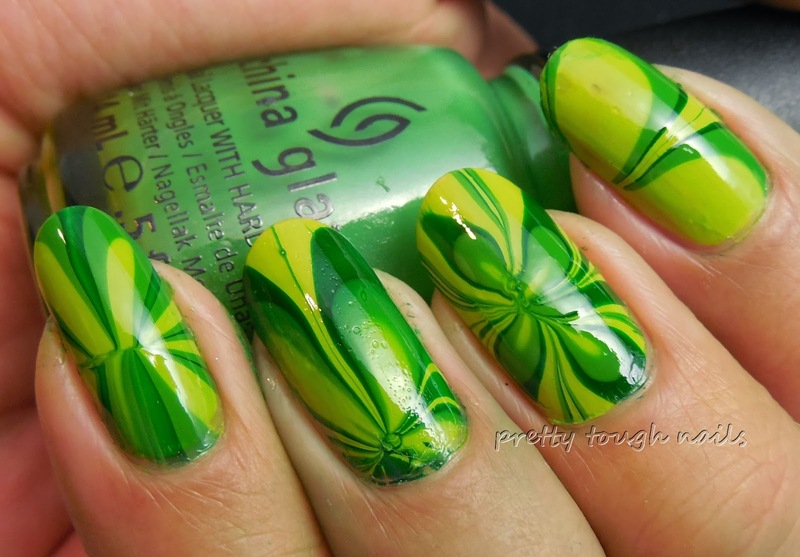 Do you celebrate this holiday, and are you planning any nail art? I love this look! It's really cool and turned out great. thank you! 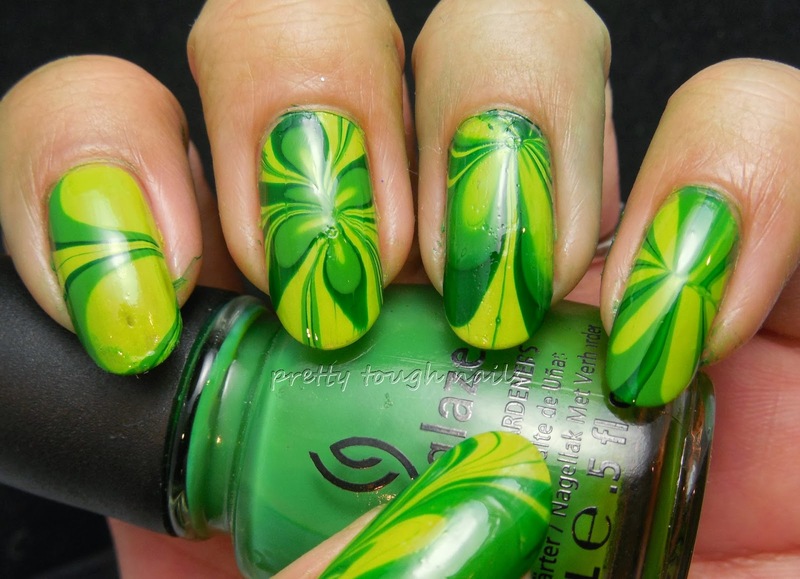 i need to work on my marbling skills! Love it! Water marbles are always so cool!